One of the app I used a lot in the iPhone is the Razor TV app. 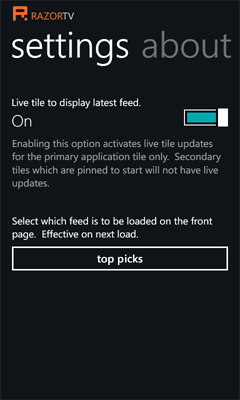 As such, I decided to port this app over to the WP7 platform. 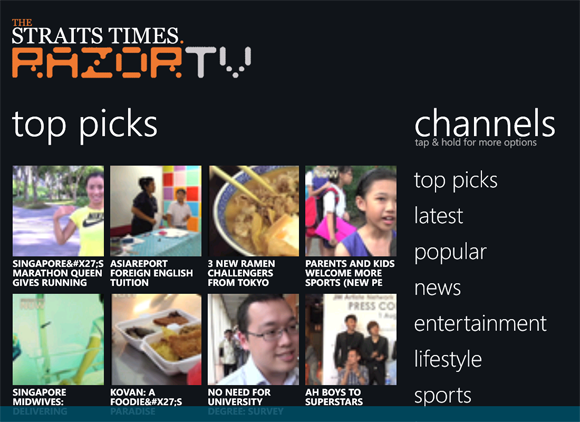 The Straits Times RazorTV is an online video news channel that webcasts from Singapore Press Holding’s Multimedia Centre web studio. It offers videos on demand for those who want to control what they want to watch and when. With a strong emphasis on hyper-local content, RazorTV is all about the latest happenings in Singapore. This free-access web TV service is an innovative convergence of both the Internet and TV platforms, a first in Singapore.